Sears may be doomed, but that doesn't mean a bankruptcy filing is imminent. 2017 is shaping up to be a year filled with retail bankruptcies. Falling mall traffic, the steady shift of retail toward e-commerce, and a growing preference for spending on experiences rather than "things" have combined to undermine profitability at many retailers. These trends have already forced nearly a dozen retailers to file for bankruptcy this year -- and it's only April. Among the most troubled retailers, Sears Holdings (NASDAQOTH:SHLDQ) stands out as by far the largest. If Sears were to go bankrupt, it could have far-reaching consequences. However, while Sears is probably doomed, it is likely to limp on for a couple more years. Sears continues to post dreadful sales and earnings results. Image source: Sears Holdings. Several high-profile retail bankruptcies occurred during 2016. The victims included once-dominant sporting goods megastore Sports Authority as well as fashion retailers like PacSun, American Apparel, and Aeropostale. The pace of retail bankruptcies has increased this year. In the first quarter of 2017, nine retailers filed for bankruptcy, including mall stalwarts such as The Limited, RadioShack, Wet Seal, and BCBG Max Azria. Earlier this month, Payless ShoeSource joined the list of 2017 retail bankruptcies. The top credit rating agencies see more pain ahead. The number of retailers considered financially distressed is at the highest level since the Great Recession. Sears Holdings is by far the largest and most important of these distressed retailers. For the past several years, Sears has been burning through cash at a rapid rate. 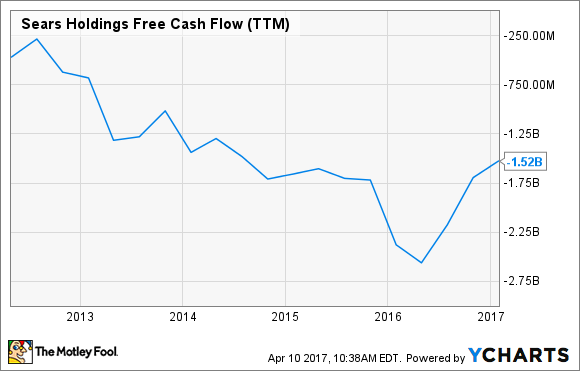 In 2016, free cash flow was negative $1.5 billion, which was actually an improvement over the previous two years. Sears Holdings Free Cash Flow (TTM), data by YCharts. Sears Holdings' deeply negative free cash flow is clearly unsustainable. However, the company has managed to stay alive up until now by steadily selling and spinning off various assets (mainly real estate) in order to raise cash. Most recently, Sears sold its Craftsman brand to Stanley Black & Decker, raising $525 million in cash. (Sears will receive additional payments in the future, bringing the total deal value to approximately $900 million.) It also sold a handful of properties in January for $72.5 million. Finally, Sears used some of its real estate as collateral to borrow more money in late 2016 and early 2017. As a result, Sears has created some breathing room for itself, despite its ongoing cash burn. Furthermore, the company is working to sell another $1 billion or more of real estate this year in order to reduce its debt and pension obligations. Meanwhile, Sears is closing more than 150 stores and reducing its overhead expenses as part of an effort to reduce costs by at least $1 billion during 2017. This should help to offset pressure on the bottom line from further sales declines. Sears' cost-cutting actions and its recent moves to raise cash -- including its plan to sell $1 billion or more of real estate later this year -- should allow the company to avoid bankruptcy in 2017. CEO Eddie Lampert is highly motivated to keep Sears solvent for as long as possible, because he is one of its biggest creditors. On the other hand, even if Sears' sales were to stay flat in 2017, $1 billion of cost cuts wouldn't get it back to breakeven. Furthermore, Sears is closing stores with combined annual sales of more than $1 billion in 2017, and comp sales have fallen at a rapid rate in recent years, including a 7.4% drop in 2016. The one Wall Street analyst who still officially covers Sears Holdings expects the company's revenue to plunge by 18% (nearly $4 billion) this year. A sales wipeout of this magnitude would offset nearly all of the company's planned cost cuts. Barring an extremely unlikely sales turnaround, Sears Holdings has no realistic chance of getting back to the breakeven mark. And while Sears still owns about 400 stores, a handful of distribution centers, and its corporate office campus, it will eventually run out of real estate (and other assets) to sell. Thus, retail analysts are right to think that a Sears bankruptcy is inevitable. It's just not going to be this year.